Picking up the latest issue of a weekly magazine, I found an article which gave insights into the natural rhythms of the body. 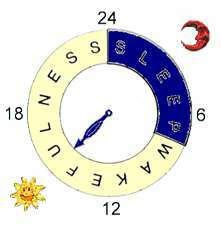 I have read of the circadian rhythm before and was aware that our body followed a certain inbuilt pattern when it came to sleeping and waking. Now the term 'Chronobiology' was quite interesting to me as 'time' is something that holds an eternal fascination for me. Myths on time always make interesting reading material. Now sleeping and waking processes may seem to be only a singular aspect of life but those patterns determine almost everything that happens to us. Small changes in our sleeping time can cause havoc to almost every aspect of our life. Quite mind-boggling! Imagining myself to be quite productive and slogging away a few nights in the week can turn my body topsy-turvy. Well, what can a few nights of sleeplessness do to me, I can think but chronobiology proves otherwise. All of us have our own rhythms and patterns that are genetic and environment-based. Artificial lights, watches, alarms and the like have tampered our natural body rhythms and in the process made us slaves to work and more work. By reading about the rhythms of the body, I realise how often that I have not let my body be according to its own rhythm. I have forced, cajoled and bribed it to work mercilessly. Here, I find that I have to mention the tribals who don't have any clocks or alarms but still maintain time accurately. No matter how tired they are, they do not wake up late, says the article. I would love to listen to my body. I do not know how easy this is going to be. Well, do you honour your body's rhythms? Do you slave or love it? Maybe you love it but still slave it. Well . . .
Chronobio...wow first time I've heard of it. There's always something new to learn. Perhaps that explains my being a night person. I feel super-sluggish in the morning, no matter how well I slept the night before. And my brain is most active nearing midnight. Have never heard of this word before so thank you for introducing me to it. When I am away on my courses I do not use an alarm to wake me up. My body is my alarm clock. I have never (so far) been late to any of my very early morning classes! Oh this is something new! I do understand basic sleep patterns and I used to sync my routine accordingly until recently. I hate alarms and never use them. Thanks for writing about this. Informative. Most of the times when I check my clock for time, it'll show me 11.11. Happens both in the mornings and the nights. And this is happening to be for the past 6 years. I was guessing this is due to my internal body clock. And your post now makes me interlink this behavior of mine to chronobiology. Interesting!! And Susan, my blog is missing your comments!! What happened? Its been a long time since you stopped by. You have to catch to up on a few of my posts :P Do visit whenever you feel like!! very interesting indeed. time has always been an eternal fascination for me too! it's kind of impossible to keep your sleeping time perfect to your biological rhythm but one must try. I can certainly tell the difference in my day when i don't sleep well for various reason. I try to be in my bedroom by ten every night to wind down and the driving force for that is the early morning hours I awake. i am a morning person whether or not I sleep well. it is so convincing that everything...EVERYTHING, happened in a flash, or blink of an eye (God's Eye?) and we are participants in the acting out of that playbook. We DO have freedom of choice, no doubt ab that. Anyway, I love to 'toy' with the notion. I do NOT lose sleep over it, BTW--grin! Gee, it's nice to visit you in this 'public' place. I have just begun a weekly class in Buddhism. First two hours was introduction: I'm hooked, and will be 'zenning' by Easter. That's a new term for me - chronobiology - but I think I recognize my body's rhythms - i try respecting them - but our urban polluted lives are often a deterrent! hmmm...interesting. I suppose I am messing with my rythum right now. You see, I should be in bed it is midnight and I work tomorrow. Yikkes - look at the clock!! I gotta go- IT'S MIDNIGHT AND PAST MY BED TIME!!!! Susan Deborah this is so interesting! I have thought about this before, also in regards to eating. I wish we listened more to our bodies and respected ourselves when we were tired or awake, hungry or full...it is so unnatural to do otherwise but what do in this world of ours? Chronobio for me is when my body is able to respond to the sequence of time it's required to perform, deliver and do something... That's just me though Susan..:) But tell you honestly, I don't really know the meaning of the word... Hahaha! Welcome here and thanks for the comment. You should read more in the link that I have provided. Glad that you wondered and have now found a direction to that wondering. I hate alarms evernthough my mobile rings at 5. 30 every morning. Whether I get up or not is another question altogether. Glad that you like the post. Artificial lights have created artificial lives. Your 11: 11 sounds interesting. Must be some karmic connection. I should comment on your blog. Many times, I just visit but don't comment. I postpone the comment and forget altogether. Apologies. Even I liked the word 'Chronobiology.' Glad that you could relate to this post, as always. Great. Welcome. Finally you arrive here and I am so glad. Alarms are the bane of body rhythms. Maybe your body clock has a rhythm which is not accepted by you. But modern lifestyle and pressures have left us so. What can be done? How can you not believe in time? Isn't it something concrete? We are participants, right but time is something we cannot ignore. Steve, please explain more. Buddhism? Hmmmm. Why Buddhism? Hope I am not bombarding you with questions. Bed time is grossly abused by most netizens. Me, being one of them. Even I think of going to bed and rising the same time but I find it quite difficult to do so. I must try practising that. My poor body is suffering due to my abusing it. Welcome. No horse here? Thanks for your kind words. Please come by more often. Thanks for the follow as well. It is highly appreciated. Of course the rhythms are to blame. Listen to them. All the creations have their rhythms and follow them as well unlike humans who don't heed anything. I'm sorry to post this here, I just didn't want you to think I was really so silly that I believed everything I read online! I'm not amiliar with the term chronobio , yet I know that sleep is a wonderul mechanism which does us a lot of good. I love to sleep and I hate alarm clocks. My body requires 7-8 hours of sleep which is considered normal. I I happen to sleep less, I have to complement the number of sleeping hours, otherwise I can't function properly. Sorry about the missing f in 'familiar' and 'If'. TROUBLE WITH THE TYPING DEVICE. Thanks for coming back. I never for a second thought that you were silly. All my thoughts were on Lewis and his books. Sorry to have stumped you. Sleep definitely does wonders to us. One should honour the body's rhythms but alas our schedules don't allow that. Maybe I should prioritise my lifestyle. Thanks for your insights, dear DUTA. They are always welcome. Oh no, I admire Lewis so much and fully believe he was a very good man. I only thought it so ridiculous that someone out there was publishing such nonsense about him. Thank you fro being such a kind understanding person! I appreciate your openness! This is your second post that took me back to childhood, for some reason! When I was still living at home, my Mom, who is a relentlessly cheerful morning person, always insisted that all I had to do was try and I could wake up early and be productive. Needless to say, I am NOT a morning person and I would insist to her that no, I really couldn't "make" myself wake up and be all hideously cheerful and perky at 6 am. When I got into junior high school, I ran across an article in a magazine about Circadian Rhythms and felt vindicated. I took the article home to finally prove to my Mom, once and for all, that no, I really can't change the way my body behaves and yes, there really IS such a thing as being a Morning or Night Person. She wasn't thrilled to be contradicted and proved wrong, but she couldn't argue with scientific proof! I still take a wee bit of delight in reminding her of this occasionally when she's all manic and uber cheerful in the morning and I'm dragging myself, stumbling and grumbling out of bed, struggling to form coherent thoughts. ;-) Give me late afternoon and evening over early morning anytime! It is quite strange, that though you not a morning person, you are called DAWN. Perhaps your mother thought that you would be like her and named you so but you turned out to be DUSK . . . I refer to the time of day, here. Thanks for the visit. It is highly appreciated.